Workout Wednesday: Seriously, What are Electrolytes? If you’re like me, you’ve stumbled across dozens of different fancy beverages containing “electrolytes” while looking for a drink to go. “Electrolytes” – this seems to be the fitness drink buzzword nowadays in many popular brands: Smartwater, Gatorade, Powerade, Propel. But what are electrolytes? How do they fit in the context of your workout, and your life? And should they be in your drink? Maybe you’ve taken chemistry so you have a general idea of the scientific context of electrolytes (if not, no worries!). Electrolytes are salts, specifically ions. In solution (dissolved in water), these ions conduct electricity. The human body contains cells, organs, and fluids that maintain balance through the use of electrical impulses. The transfer of these impulses depends on the existence of electrolytes and an electric current. It is the job of the kidney to regulate electrolyte concentrations in the bloodstream despite changes in the body. In your body, the major electrolytes include sodium, potassium, chloride, calcium, magnesium and a few others. Whenever you sweat heavily through exercise, electrolytes are lost – mainly sodium and potassium. Here’s where the drinks come into play. It’s important to replace these lost electrolytes during and after exercise to maintain body fluids concentrations and stay healthy. Several factors influence which type of drink you should reach for when exercising: duration of exercise, intensity level, body size, environment conditions, and the degree of sweating. For most people performing moderate exercise, drinking just water for hydration will do the job. However, individuals working out for longer periods of time (in the ballpark of more than 1.5 hours) at a more intense level may need to replenish electrolytes in addition to hydration. Drinks with electrolytes sound like a great idea, right? 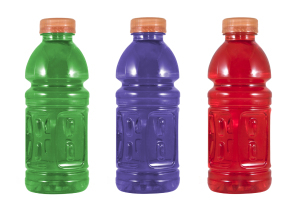 However, many sports drinks are also filled with sugar, which ultimately cause more harm than help. Here’s the bottom line – choose your drink carefully. Read the label, and choose a drink with very little sugar content. Bottled coconut water is a great natural option for electrolyte replenishment if you’re heading out to for some very intense exercise. But for most cases, water is the best option. If you have more detailed concerns, research your specific question or talk to your doctor. Here at Campus Rec, we celebrate self-acceptance. We also encourage you to make the best choices to take care of your body. Whether you’re at home playing tennis with friends or walking to class through “The Pit,” remember to stay hydrated with a smart choice! Previous Article How Dirty is Your Money?